You'll have to hoof it over to Lewisburg. 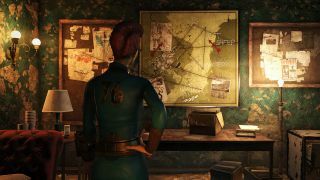 There’s a new patch out today for Fallout 76, and along with the usual bug fixes and adjustments comes a brand-new questline. Called "Lying Lowe," the quest sends players hunting for clues to help determine the fate of a pre-war brother and sister, who may have crossed paths with a legendary West Virginia cryptid called the Sheepsquatch. The adventure begins in Lewisburg, where players can find posters put up by someone named Shelley van Lowe. It seems Shelley was in search of her brother Calvin, and believed that he may have met a gruesome fate at the hands of the Sheepsquatch—the "fabled wooly terror" of West Virginia, according to Bethesda. As it turns out, the Sheepsquatch is a genuine local legend in certain counties of West Virginia, with a smattering of sightings reported in the mid-1990s. The Lying Lowe questline is structured like a pulp mystery, so you’ll be digging up clues and following leads just like in the good old (future) days with Nick Valentine. You can start the quest by finding one of the "Sheepsquatch Ate My Brother" posters scattered around Lewisburg, and available free in the Atomic Shop. The other big ticket addition with Patch 8 is a new high-level dungeon called The Burrows, which will be available starting April 16. Bethesda says this is a "challenging experience for even the toughest of Wasteland adventurers," and is set beneath Harper’s Ferry. From the sounds of things, this will be one to do with a team. The official patch notes have all the details on the balance changes and other adjustments made in Patch 8. Bethesda has addressed quite a few minor bugs and added a few nice interface features, such as the ability to rename items. Now you’ll be able to hunt the Sheepsquatch armed with a "baseball baaaaaat."